Let me start off by saying some of you saw on Instagram when I posted a photo of a box from Greece. Some of you guessed wrong, but some of you guessed right – that box did indeed have a Jam Pedal in there – the Jam Pedals Delay Llama. Typically, I get a pedal, give it a few plays then write about it. I posted that photo on Instagram a week ago… but no post. Why? Because, I can’t stop playing the damn thing. I like delays, for various reasons and applications. Sometimes it’s about building the base foundation of your tone? Sometimes it’s about getting crazy. Sometimes it’s about precision and clarity, etc. The Jam Pedals Delay Llama provides that super great analog delay sound with the dark repeats. I’m such a sucker for these. The Delay Llama is officially a ‘Tape Echo’ that will get you 600ms of delay love using the old school BBD (bucket brigade device) analog ICs. When it comes to delay, I love simplicity. 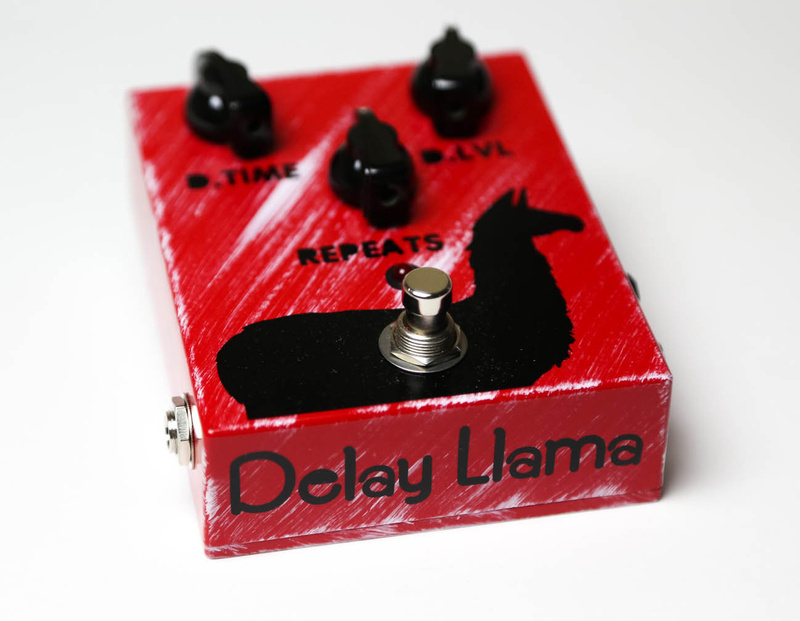 The Delay Llama comes with the controls you would expect – Delay Time, Delay Level and Repeats. The Delay Llama sounds absolutely fantastic, and is easy to dial in slap back, warm repeats for base tone, and crazy oscillating long feedbacks with tweakable speed for crazy knob twisting. The repeats are fantastic – I love the darker repeats with a bit of grit. To me, the Jam Pedals Delay Llama is the perfect analog delay. Sounds amazing. Simple to use functionality, but more importantly, easy to dial in a variety of delay options. If you’re looking for pristine delay with dotted eighth notes, well, this isn’t the delay for you. I also really like that Jam Pedals is based out of Greece. Don’t get me wrong, I love made in the US stuff, but I also can imagine how hard it is to compete in the world market. These guys make great products and is definitely worth looking at their other offerings! Be sure to check them out on Facebook, Instagram and on the web. If you’re looking for a great sounding analog delay, this is your guy. You can pick up the Jam Pedals Delay Llama for $239. Let me know what you think about the Jam Pedals Delay Llama by commenting below!! I’ve had one on my board for a couple of years now – absolutely love it! The repeats distort easily if you give it a hot or bass-heavy signal (my mate plugged his bass guitar into it for laughs…it just farted at us!) so if you’re wanting a pristine, clear delay for your glassy clean tones this might not be it. But give it a compressed overdrive signal…you’ll not find any other delay that ingrains itself in your tone as well as the DL. Pure, old-school, crunchy, analog goodness – it’s fabulous! !